Knowsley Safari Park was dedicated to the public in July 1971 by the 18th Earl of Derby. The Earls of Derby have been avid wild life conservationists. Over a hundred and fifty years ago, the thirteenth Earl of Derby kept a huge private zoo, which covered almost 100 acres of Knowsley estate. It included 94 species of mammals and 318 species of birds. At the time when the Knowsley Safari Park was opened, the whole concept of safari i.e. having visitors in cars and the animals roaming free was new. The Safari Park became a huge draw and crowds thronged in. The Knowsley Safari Park, which started with a three and a half mile original route expanded with a further one and a half miles of road in 1973.The park houses more than 250 animals and is visited by nearly three hundred thousand visitors per year. 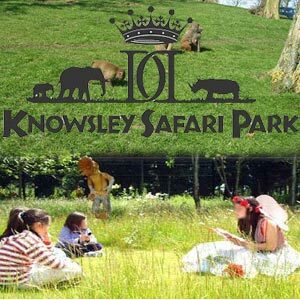 The entry charges for the Knowsley Safari Park range between ?6.00 for children to ?25 for families. The Park also provides alternate routes for visitors who are afraid to take their cars nearer to the animals. The Knowsley Safari Park also offers an amusement park for visitors. The Amusement Park provides various rides like roller coaster, twisters etc. The Knowsley Safari Park has children's zoo where children can feed and stroke farmyard animals in a rustic setting. A few animals housed in the Safari Park are Lions, African elephants, White rhinos, tigers, baboons, camels, bison and zebras. In the words of the eminent Limericks writer Edward Lear, the park has "Almost all the animals under the sun". Edward Lear, a regular visitor to the park claimed that he was inspired to write his most acclaimed work "The Book of nonsense" by the Knowsley Park inmates. The park has a unique 'Adopt an animal' scheme where animal lovers can contribute towards the welfare of an animal by sponsoring their needs for one year. The breeding plans of the Knowsley Safari Park have a very high rate of success and almost all animals except elephants have been born there.